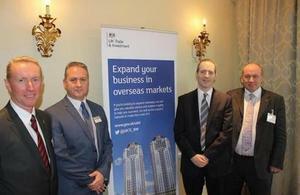 Lord Livingston urged UK businesses to consider the opportunities for export to Latin America during 'Export Week' event in Bournemouth on 12 November 2014. Delegates heard from companies that have successfully made the leap to Latin America, and UKTI demonstrated how it can support businesses with their overseas trade plans. South West businesses are strong exporters, who grew their overseas sales by almost £400 million in the first 6 months of this year. Lord Livingston spoke about some of the export successes to have come out of the South West region, such as Poole-based Heatric, part of the Meggitt PLC Group. Heatric has recently won a £80 million contract in Brazil. Read more about Heatric’s success in Brazil. We’re delighted that Lord Livingston has joined us during Export Week. This event has proved to be an interactive and thought-provoking seminar, providing delegates with a sound understanding of each market and showing how businesses can successfully export to the exciting region of Latin America. Mercado Libre is Latin America’s leading e-commerce site. It’s signed an agreement with UKTI which is part of UKTI’s e-exporting support programme. The agreement gives preferential terms to UK companies that are introduced via UKTI, with free commercial listings for the first 6 months. Lord Livingston also visited Poole-based precision engineering specialist Field International Ltd, to discuss how UKTI can help Mid-Sized Businesses. Want to find out how UKTI can help you? Arrange a face to face meeting with an International Trade Adviser.